including General Westmoreland. In his 1976 book, A Soldier Reports, Westmoreland revealed that President Johnson expressed regrets he had not imposed censorship and the General obviously shared that regret. The “stab in the back myth” was not a myth, but reality. The “stab in the back” that ended the war for Germany was nothing more than the same Zionist engineered Bolshevik revolution that eliminated Russia’s involvement in the war two years earlier. Excellent and illuminating article; I hear george h.w. bush sneeringly saying (after the 1st gulf war), “I hope we can finally now be over the ‘Vietnam Syndrome! '” This shouldn’t be surpassing given he and his father presscott were involved in a group similar to pnac advocating that JFK should just, “Man up! 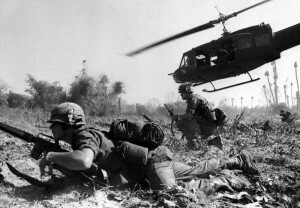 Go ahead and introduce combat troops into vietnam and take another crack at cuba.” At the time of Kennedy’s death backchannels were well under way that could have resulted in the return of previously “nationalized” properties and revival of normal relations with cuba. Jeb bush was one of the founders of pnac, the neocon vehicle thru which his brother was enabled to lie our nation into endless wars, leaving us less well off and less well thought of on the world stage … not to mention how easy it is 4 these men to put other men’s sons and daughters at risk, but not wanting their own to serve. Terrific article. I would add that Clausewitz’s notion of “War as politics by other means” is at the heart of why he reasoned that defensive, rather than the offensive war is more likely the winnable proposition. War of aggression generally has no political legitimacy; it is an economic strategy. One might say that, “Imperialism is capitalism by other means”. The initiation of hostility by an aggressor nation immediately and irrefutably defines and validates the political legitimacy of the defensive position. It implicitly defines the “sovereign”. The aggressor lacks the homogeneous resolve of political consensus at home. This necessitates eradication of what it perceives to be “internal enemies”. What the perpetrators of information warfare against the American public embrace is exactly that ideology crafted by Carl Schmitt, Hitler’s lawyer and the author of the juridical rationalization for “Sovereignty”. Bear in mind that the authors of NDAA and The Patriot Act actually referenced Schmitt’s work in the construction of those laws. When they claimed “legal precedent” for those laws, they were referring to the work of the man called, “The Crown Jewel of Nazi Jurisprudence”. The sovereign, according to Schmitt, is “He who makes the friend/enemy distinction without contradiction”, which necessitates the ability to declare a “State of Exception”, or in common parlance, “martial law”. It is a form of circular reasoning in which empowerment of the “sovereign” turns on his discretion to impose authority without statutory impediments. In other words, it represents primacy of political over legal authority. “Genuine political authority cannot be constrained by any legal statute”, according to Schmitt. This position validates the authority to turn the mechanisms of the state against its own citizens in order to maintain Sounds like the “Imperial Presidency”, doesn’t it? Of course, there are simplistic historical vignettes that may seem to refute this treatise. Vichy France, a country full of fascist sympathizers in the military and in right wing politics, embraced the enemy and colluded with the Nazis. Though they represented a minority, the Vichy government achieved legitimacy because it served the will of the wealthy and powerful – though treasonous – oligarchs. As our government continues to serve the whims of corporate and financial interests who increasingly escape regulation by seeking “multinational” status, we must begin asking, “What country does my government represent?” Fascism ALWAYS leads to war. It lacks a sustainable economy in the absence of economic conquest. Viet Nam, as a “twenty five year war”, was actually an economic, not a political strategy. Predictably, that’s why we lost. Well said. I’ve written a little about Schmitt elsewhere in “Guantanamo at 10.” I had a hard enough time getting this down this size but there’s a lot more to be said to chronicle our journey to authoritarianism. Now, how to stop it. Thank you both for the reply. It looks like I left out a word, ‘sovereignty’, followed by a period after the word maintain. The reality of what we’ve become bakes my blood boil, hence some errors. These truths need to be more widely disseminated before we reach a tipping point beyond which there is no return. Sometimes, I think maybe we already have. I would like to simply complement Mr Piece for writing such a informative, and great article. Thank you, I learned a lot reading this article. J.T. Thank you for reminding us of this history. This kind of analysis is exactly why the founders put freedom of the press in the bedrock of the U.S. legal system.